Measure the length of your shadow. Use a tape measure or yardstick (meter ruler) to measure your shadow from your feet to the tip of your shadow. If you don’t have someone to assist you, you can mark the end of the shadow by tossing a rock onto it while you’re standing. Or better yet, place the rock anywhere on the ground, and then position yourself so the tip of your shadow is at the rock; then measure from where you're standing to the rock. Measure the length of the tree’s shadow. Use your measuring tape to determine the length of the tree’s shadow from the base of the tree to the tip of the shadow. This works best if the ground all along the shadow is fairly level; if the tree is on a slope, for example, your measurement won’t be very accurate. You want to do this as quickly as possible after measuring your shadow, since the sun’s position in the sky (and hence the shadow length) is slowly but constantly changing. If you have an assistant, you can hold one end of the measuring tape while he or she measures the tree’s shadow, and then you can immediately measure your shadow. Calculate the tree’s height by using the proportion of your shadow’s length to your height. Since you know the length of the tree’s shadow, and you also know that a certain height (your height) produces a certain shadow length (the length of your shadow), you can determine the tree’s height with a little math. Multiply the length of the tree’s shadow by your height, and then divide the resulting number by the length of your shadow. For example, if you are 5 feet (1.5 meters) tall, your shadow is 8 feet (2.4 meters) long, and the tree’s shadow is 100 feet (30.48 meters) long, the height of the tree is (100 x 5) / 8 = 62.5 feet (30.48 x 1.5 meters) / 2.4 meters. Note that the order of your multiplication does not matter. Stand far enough from the tree so you can view the whole tree—top to bottom—without moving your head. For the most accurate measurement, you should stand so that you are on a piece of ground that is about level with the ground at the tree’s base. Your view of the tree should be as unobstructed as possible. Have a friend stand near the tree. Hold a pencil or a small, straight stick (such as a paint stick or ruler) in one hand and stretch your arm out so that the pencil is at arm’s length in front of you (between you and the tree). Move your thumb up or down the pencil so that the tip of your thumbnail is aligned with the tree’s base. While holding the pencil in position so that the tip is aligned with the tree’s top (as in step 3), move your thumb to the point on the pencil that covers the point (again, as you look “through” the pencil with one eye) where the tree meets the ground. Rotate your arm so that the pencil is horizontal (parallel to the ground). Keep your arm held straight out, and make sure your thumbnail is still aligned with the tree’s base. Have your friend move so that you can sight his or her feet “through” the point of your pencil. That is, your friend’s feet should be aligned with the pencil’s tip. He or she may need to move backward, sideways, or diagonally. Since, depending on the height of the tree, you may need to be some distance away from your friend, consider using hand signals (with the hand that is not holding the pencil) to tell him or her to go farther, come closer, or move to the left or right. Measure the distance between your friend and the tree. Have your friend remain in the place or mark the spot with a stick or rock. Then use a measuring tape to measure the straight-line distance between that spot and the base of the tree. If you don’t have a measuring tape you can pace out the distance, although this will not be as accurate. The distance between your friend and the tree is the height of the tree. 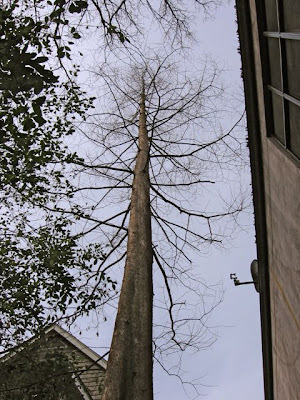 Measure the angle of elevation to the tree’s top. Sight the top of the tree and use a clinometer or transit to measure the "angle of elevation" between the tree and the ground. The angle of elevation is the angle formed between two lines—the flat plane of the ground and your sightline, to some elevated point (in this case, the tree’s top) — with you as the vertex of the angle. Multiply your distance from the tree (measured in step 1), by the tangent of the angle of elevation. The resulting number is the height of the tree minus your height. Add your height to the height you calculated in the previous step. Now you have the height of the tree. You need to add your height because you measured the angle of elevation from eye level, not from the ground. Fold a square piece of paper in half so that it forms a triangle. The triangle will have one right (90 degree) angle and two 45 degree angles. Hold the triangle near one eye so that the right angle faces away from you and one side is horizontal (parallel to the ground, assuming the ground is level). Move back from the tree until you can sight the top of the tree at the top tip of the triangle. Close one eye to sight the tree’s top. You want to find the point where your line of sight follows the hypotenuse of the triangle to the very top of the tree. Mark this spot and measure the distance from it to the base of the tree. This distance, plus your height(because you used the angle of elevation from eye level, not from the ground)is also the height of the tree. This works because the angle of elevation using your triangle is 45 degrees, and the tangent of 45 degrees = 1. Realize that many times using DBH (diameter at breast height) is a more useful and much easier way of assessing a tree's size and age. For increased accuracy using the shadow method you can measure the shadow cast by a yardstick or similar straight stick of known height instead of a person’s height. Depending on how you are standing, your height may vary (i.e., if you are slouching or tilting your head slightly). Clinometers and transits are tools which allow you to measure the angle between a horizontal plane and the object you are looking at (the transit, in particular, also is used to measure angles between vertical planes). You want to measure the angle between the ground and the tree’s top, but the clinometer or transit will measure the angle between the horizontal plane at your eye level (since you look through the instrument), and this is why you need to add your height to the calculation. Some clinometers and transits, however, allow you to adjust for your eye height. If you have already adjusted for your height do not add your height at the end of the calculation. You can make a simple clinometer very easily using a protractor. Check out the related wikiHow for instructions. These methods do not work well if the tree is on sloping ground. National Trust of Australia Instructions on how to take measurements of trees, including girth, spread, and height. Article provided by wikiHow, a collaborative writing project to build the world's largest, highest quality how-to manual. Please edit this article and find author credits at the original wikiHow article on How to Measure the Height of a Tree. All content on wikiHow can be shared under a Creative Commons license. I was just thinking about this the other day and had remember seeing the pencil method in a book a while back. The next time someone call and says that a person is removing a 100 foot tall oak tree I will ask "to determine the height did you use the pencil method, shadow method... to determine the height." I use the Angle of Elevation method mostly, and having a Clinometer is the most 'technical'. Prices for those start at $131 at Forestry Suppliers. Believe it or not, the shadow method is, for me, the most accurate. - but it only works in wide open spaces and with trees that are not very tall. Try using the fixed angle method with children for a scout project or something. You can use triangle drawing on cardboard to measure height. Triangle on drawing has similar angles to imaginary triangle on landscape. If length of one side of imaginary triangle is known, then all triangle sides can be calculated by measuring triangle drawing. No need protractor, no need trigonometry calculation. No need to visit object to measure directly. You can draw scale map by using the same triangles method, the produced map is good enough to check landscape distance, area, and landscape planning, etc.. And its simple enough to play treasure hunt game.